We can offer you the services to both carry out the electrical testing of your property, and then if it isn't up to the current standard; offer you a quote to bring it up to the required level. We can carry out all your P.A.T. Testing requirements, and provide you with a complete itemised list of every item tested along with all their results. Contact for Electrical are able to cover all your electrical needs; from large industrial work, to commercial and domestic installations. We are available to assist you with any of your work requirements, at any time. Please just get in touch with us and we will do our best to help you as soon as possible. Contact For Electrical are agents of 'Handicare', formerly known as 'Minivator'. We are able to provide the installation of stairlifts and have done so for numerous houses and homes. 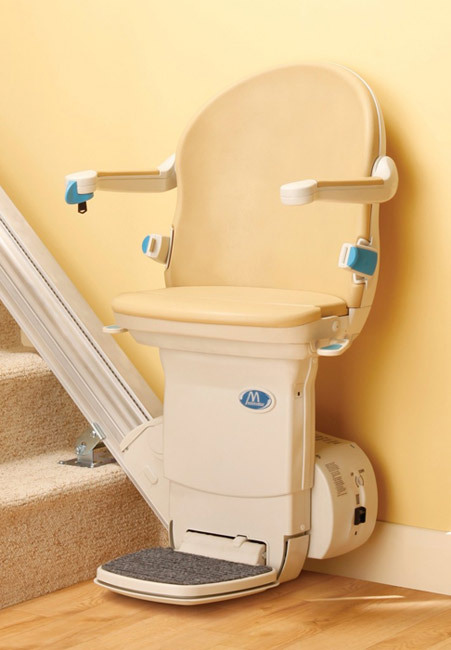 Where stairlifts have incorperated battery back up, wether the unit is new or reconditioned, we provide a 3 year full guarantee, with 3 service visits carried out annually. We install an independent switch fused spur (power supply) which is unqiue for each stairlift in an installation, and on completion you are provided with the relevant electrical certification for the work carried out. 'Handicare' offer a wide range of stairlift solutions as they're fortunate to have two internationally successful stairlift manufacturers within their Group. Both 'Minivator' and 'Freelift' have been supplying the UK stairlift market for decades and both have a well established global reputation for reliability and safety, and now all come under the 'Handicare' name. Contact For Electrical are also able to offer to supply, deliver and install, or repair Bathlifts. We can offer many further mobility solutions for the disabled and elderly, please get in touch with us to find out more. © 2011 Contact for Electrical. All Rights Reserved.